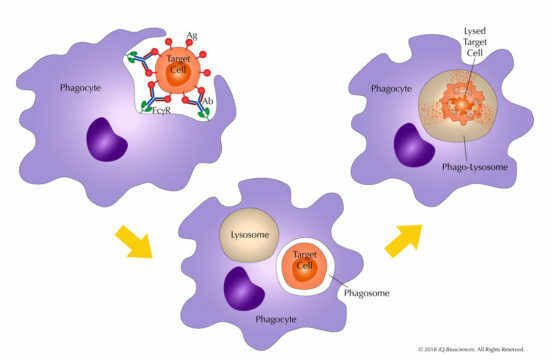 Antibody-dependent cellular phagocytosis (ADCP) is a cellular process by which effector cells with phagocytic potential, such as monocytes and macrophages, can internalize target cells. Once phagocytosed, the target cell resides in a phagosome, which fuses with a lysosome to begin degradation of the target cell via an oxygen-dependent or independent mechanism. This function is dependent on opsonization, or identification of the target cell with an antibody, which then also serves as a bridge between the target cell and the phagocytic cell. Mechanistically, the antibody binds its cognate antigen on the target cell through its antigen recognition domain, and then recruits the phagocytic cell to the target with its Fc region. Once bound to the Fc receptor of the phagocytic cell, the target cell is ingested and degraded. This process also leads to the production of soluble factors by the effector cells that help initiate and drive the immune response. ADCP can play roles in general human health and mechanism of action for therapeutic antibodies. First, it can eliminate foreign pathogens, such as bacteria and viruses, that would otherwise promote illness in general human health. Second, it is suggested that ADCP may be a mechanism of action for some therapeutic antibodies, such as those that target CD20 and CD52. Over the last few years, more and more drug development programs are screening potential therapeutic antibody candidates for ADCP activity to identify ones that will have the most potent anti-cancer abilities. Glycosylation state– antibodies are glycosylated and the oligosaccharides expressed on them can affect ADCP. Afucosylated antibodies, which do not have the sugar fucose on the oligosaccharide chain attached to Asparagine 297, have been shown to increase ADCP on effector cells, such as non-classical monocytes, that use FcgRIIIa (CD16) for phagocytosis. Phagocytic effector cell subtype – Monocytes and macrophages are two important immune cell types that can perform phagocytosis. However, each are reported to perform ingestion of target cells through different Fc receptors. For non-classical monocytes, it is suggested that FcgRIIIa mediates phagocytosis, while in macrophages, it is FcgRIIa. Fc receptor polymorphism– the FcgRIIa and FcgRIIIa have polymorphisms that have been linked with clinical outcome. Here, alleles that are associated with the high-affinity receptors bind antibodies stronger, resulting in better effector function. At iQ, we can perform ADCP assays with a reporter cell line or primary cells. In the reporter cell assay, a modified Jurkat cell line expressing the high-affinity form of FcgRIIa (H-131) expresses luciferase upon engagement of the receptor with the antibody. Expression of luciferase can be detected with a luminometer after addition of a substrate. With this assay, we are not measuring phagocytosis of any cells, but the engagement and activation of the Fc receptor that is responsible for this process. However, this is a high throughput assay that can be used to screen molecules much more quickly than assays that employ primary cells. See Figure 1 for an example of our ADCP assays using a reporter cell line. Figure 1. ADCP assay using FcgRIIa expressing reporter cell line. Modified Jurkat cell line expressing FcgRIIa were co-cultured with target cells in the presence of a test article (4) or negative control antibody. Substrate was added to assay for luciferase expression, which is regulated by FcgRIIa engagement with test antibody. Plates were read on a luminometer and results were reported as relative light units. In contrast, our ADCP assays that use primary cells measure true phagocytosis by assaying for internalization of target cells. Here, target cells are fluorescently labeled and cultured with effector cells, such as monocytes or macrophages, in the presence of your therapeutic antibody. Flow cytometric analysis is subsequently performed to determine the percentage of effector cells that are positive for the target cell based on its corresponding fluorescent marker. This method offers measurement of a more biologically relevant functional process in contrast to the reporter cell line. However, this method requires more cell manipulation and may require more time to perform. 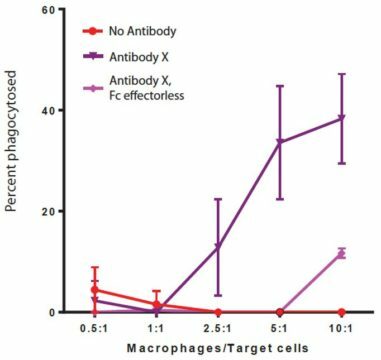 See Figure 2 for an example of our ADCP assays using differentiated macrophages. 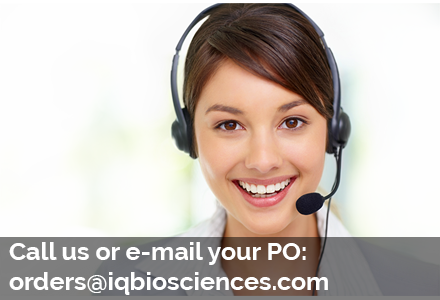 Depending on your requirements, iQ Biosciences can recommend the best experimental method for your goals. Figure 2. 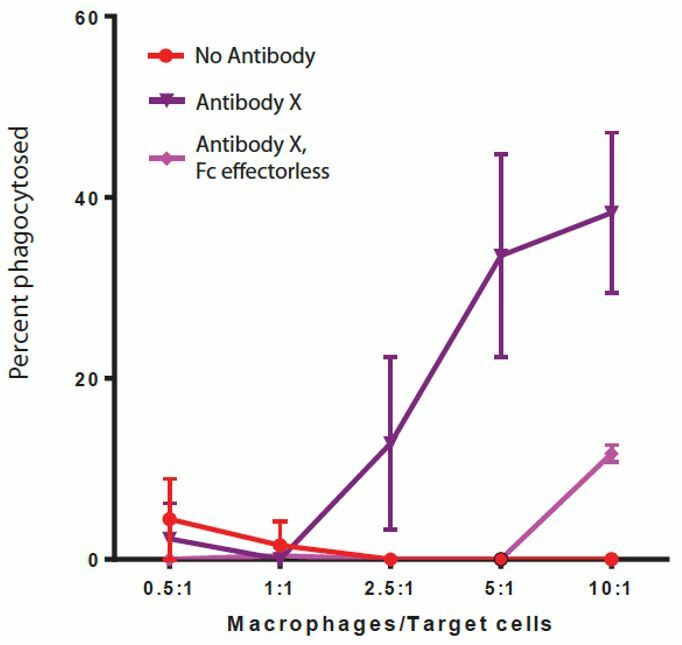 Percent of macrophages phagocytosing target cells at different macrophage:target ratios. Human monocytes were cultured with MCSF to differentiate them into macrophages. Macrophages were then co-cultured with fluorescently labeled target cells in the presence of Antibody X, Fc effector-less Antibody X, or no antibody. Flow cytometric analysis was performed to determine percentage of macrophages positive for target cell fluorescence. With our extensive knowledge of factors that influence ADCP and our flexible readouts for ADCP, iQ can help you design the right experiments to determine the ADCP potential of your therapeutic antibodies. At iQ Biosciences, we understand that each client is unique. Upon quote request, we will provide complimentary consulting services to determine how to tailor our services to best meet your goals. Based on this preliminary assessment, we will be able to provide a price quote. Fit a timetable appropriate to your research goals. We work with you to determine your expected turn-around on a case-by-case basis and ensure that our services fit your needs. Some experiments may require an expedited service – please inquire for more information.